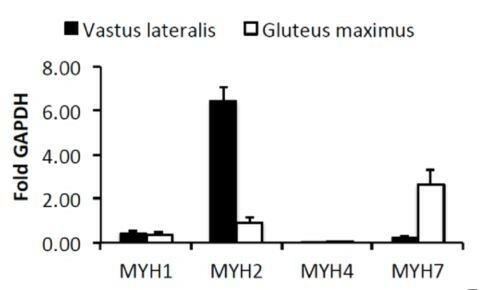 Rhythmic gene expression in human skeletal muscle. 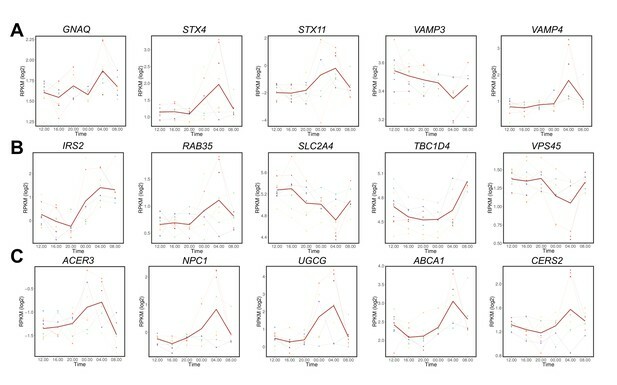 (A) Heat map showing genes rhythmic at the pre-mRNA and mRNA level (R-I.R-E: upper panel), at the pre-mRNA level only (R-I: middle panel), and at the mRNA level only (R-E: lower panel). Standardized relative gene expression is indicated in green (low) and red (high) and ordered by their respective phase. (B) mRNA half-life proxy by exon/intron ratio showing lower stability for genes with rhythmic mRNA (R–E) profiles. (C) Amplitude distribution of genes that are rhythmic only at the mRNA level (R-E, blue), the pre-mRNA level (R-I, red), or rhythmic for both (R-I.R-E). Genes with higher amplitude of transcription at the pre-mRNA level have a higher probability to be rhythmic at the mRNA level (R-I.R-E). (D) Number of genes in each group in relation to the -log10 BH corrected p-value; dashed line indicates threshold of 0.05. (E) Phase distribution at the pre-mRNA and mRNA level for the three groups described in (A). (F) Phase distribution for genes activated by acute muscle exercise (red), inflammation (blue), or both (green). 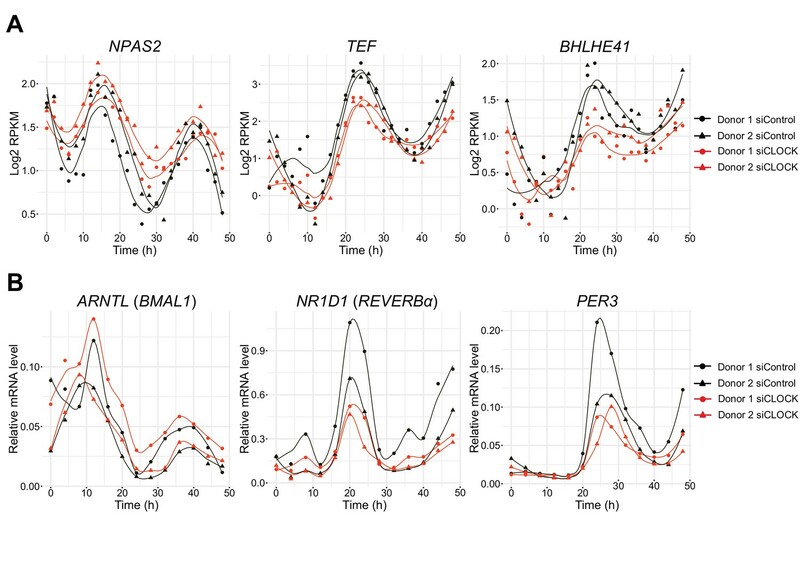 (G) Temporal expression of core clock components, and (H) key muscle transcription factors. N = 10 human muscle biopsy donors. (I) Phase distribution of predicted rhythmic DNA motif activity. List of 9211 genes identified by RNA-seq analysis in human skeletal muscle. Rhythmic transcripts (5748) were grouped into genes rhythmic at the pre-mRNA and mRNA level (R-I, R-E), at the pre-mRNA level only (R-I), and at the mRNA level only (R-E). GO term enrichment analysis for transcripts identified as rhythmic in human skeletal muscle. Temporal gene expression in human skeletal muscle. (A) Temporal expression of genes involved in vesicular trafficking; (B) Temporal expression of genes involved in glucose uptake; (C) Temporal expression of genes involved in lipid metabolism analyzed by RNA-seq. N = 10 human muscle biopsy donors. Disruption of the circadian oscillator impacts on functional gene expression hSKM. 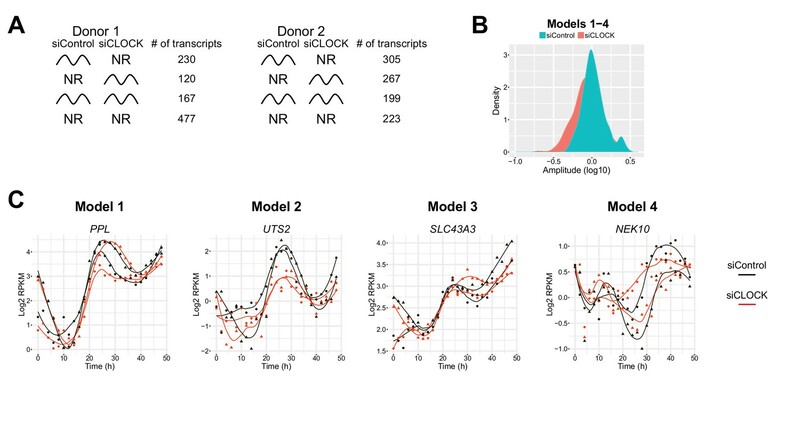 Differential gene expression analysis between hSKM bearing a disrupted (siCLOCK) or intact (siControl) circadian clock. Comparison of the median gene expression at all analyzed circadian time points between the two groups. A total of 16,776 genes were detected by RNA-seq as expressed above the threshold of counts per million (CPM) >3. (A) Core clock genes; (B) 15,446 genes remained unchanged (dark blue), and 1330 genes exhibited a significantly different expression level upon siCLOCK-mediated clock disruption (light blue), with 588 being up-regulated (orange) and 742 down-regulated (grey) (FDR <0.05 and p-value <0.05). Altered genes comprised those related to glycerophospholipid and triglyceride metabolism, storage and transport (C) inositol phosphate metabolism (D) and sphingolipid metabolism and storage (E). 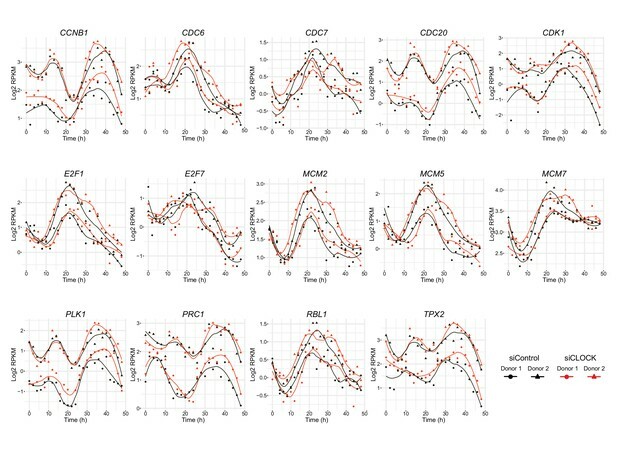 (F) Relative levels of PC, PE, PI, PS, Cer GlcCer, SM, CL and TAG, analyzed by mass spectrometry based lipidomics in hSKM cells transfected with either siControl (orange bar) or siCLOCK (blue bar). Total phosphatidylcholine (PC) and glycosylceramide (GlcCer) levels are significantly decreased or increased, respectively, upon siCLOCK transfection. Data are mean ± SEM, N = 4 (# p-value <0.05). (*) for FDR <0.05, (**) for FDR <0.01, (***) for FDR <0.001. List of 16,776 genes identified in hSKM by RNA-seq and used for the differential analysis. Related to Supplementary file 1-tables S2-8. GO term enrichment analysis, using the Panther classification system, for transcripts that were down- and/or upregulated upon clock disruption. Related to Supplementary file 1-table S4. Reactome pathway analysis, using the Panther classification system for transcripts that were down- and/or upregulated upon clock disruption. Related to Supplementary file 1-table S5. 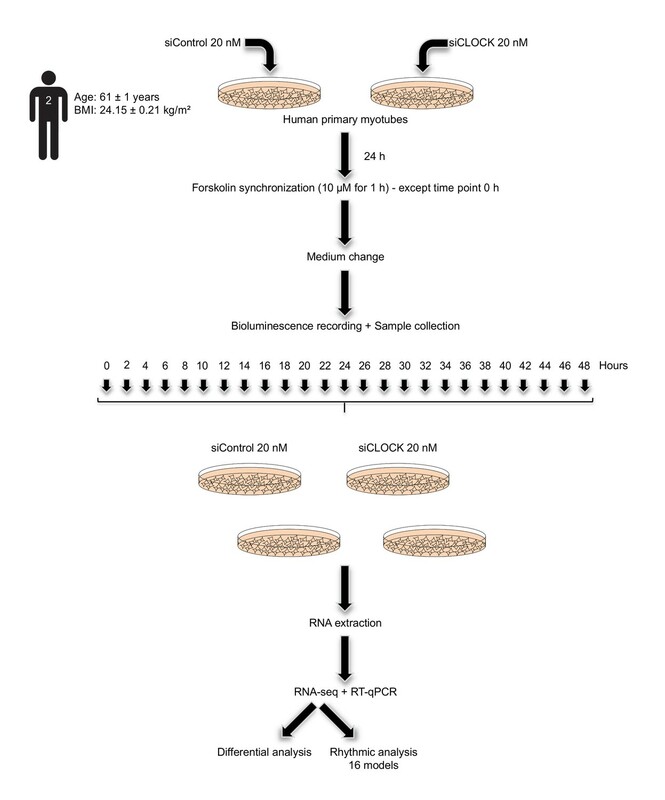 Primary human myotubes were transfected with 20 nM of non-targeting siRNA (siControl) or with same amount of siCLOCK at day 6 of differentiation. 24 hr following siRNA transfection, in vitro synchronization by 10 µM forskolin pulse during 1 hr was conducted for all the dishes, except for those collected at time point 0 hr. Cells were harvested in duplicate dishes for each time point and for each donor, every 2 hr during 48 hr. Extracted RNA samples were subjected to RNA sequencing analysis or to real-time quantitative PCR (RT-qPCR). 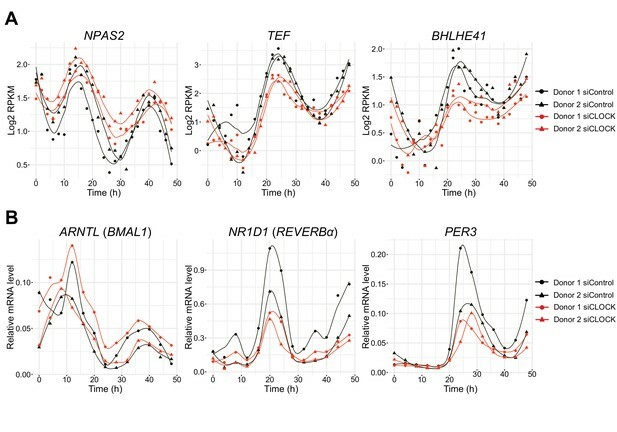 siRNA-mediated CLOCK knockdown leads to a flattening of the Bmal1-luc circadian oscillation amplitude in hSKM. Human primary myoblasts were transduced with lentiviral particles expressing Bmal1-luc and differentiated into myotubes. siControl or siCLOCK transfection was performed 24 hr prior synchronization with forskolin. (A) CLOCK mRNA was measured by RT-qPCR in samples used for RNA-seq and collected at time points 0 hr (before synchronization), 24 hr and 48 hr. Data were normalized to the mean of 9S and HPRT. CLOCK expression was reduced by 82 ± 4% (mean of the three time ± SEM, N = 2, done in duplicates; (***) p-value <0.001) in siCLOCK-transfected cells. (B) Bmal1-luc bioluminescence profile shows an important reduction of amplitude in siCLOCK-transfected myotubes compared to controls. Representative Bmal1-luc oscillation profiles are shown for non-transfected (light blue line), siControl (black line), and siCLOCK (red line) transfected myotubes. Bmal1-luc oscillation profiles were recorded in duplicates (two experiments, one donor per experiment). 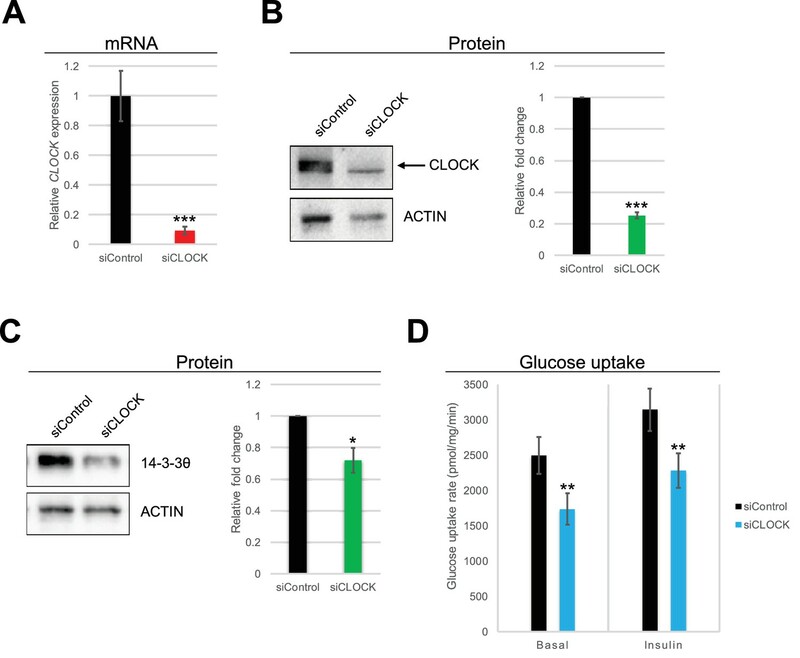 Basal and insulin-induced glucose uptake by hSKM is downregulated in the absence of a functional circadian clock. (A) CLOCK mRNA was measured in hSKM cells transfected with siControl or siCLOCK by RT-qPCR and normalized to the mean of 9S and HPRT. CLOCK expression was reduced by 91 ± 2% (mean ± SEM, N = 4; (***) p-value <0.001) in siCLOCK-transfected cells. Protein levels of CLOCK (B) and 14-3-3θ (C) were assessed by western blot. Left panel: representative western blot; right panel protein quantification over all monoplicates (mean ± SEM, N = 5). CLOCK and 14-3-3θ protein levels were reduced by 75 ± 2%, and 28 ± 8%, respectively. (D) Glucose uptake rates (in pmol/mg.min) measured in the absence (basal) or presence (insulin) of insulin (1 hr, 100 nM) in siControl or siCLOCK-transfected cells. Note significant reduction of basal (31 ± 3%) and insulin-stimulated glucose uptake (28 ± 3%). Data are mean ± SEM of four independent experiments using myotubes from four different donors (same as for A-C). (*) p-value <0.05, (**) p-value <0.01, (***) p-value <0.001. 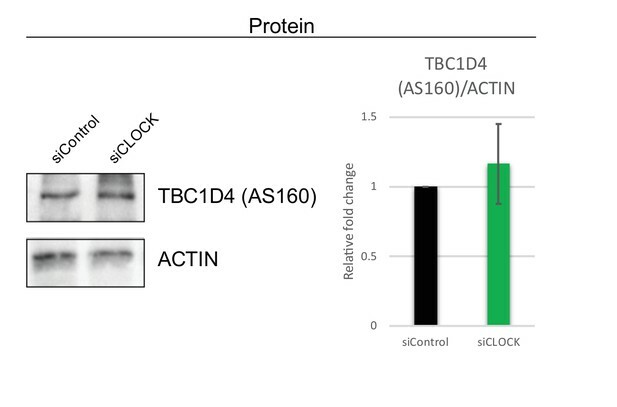 TBC1D4/AS160 protein levels are not affected by siCLOCK. Representative western blot for TBC1D4/AS160 in hSKM cells transfected with either siControl or siCLOCK for 72 hr. Quantification of TBC1D4/AS160 protein levels shows no statistically significant difference of upon CLOCK disruption. Data are mean ± SEM (N = 5, monoplicates). Temporal gene expression analysis in human skeletal myotubes bearing a disrupted or functional circadian clock. (A) Total of 12,985 genes were identified by RNA-seq as expressed above log2 RPKM >0. Genes were subjected to the circadian analysis, adapted for high-resolution datasets over 48 hr. Genes were categorized as rhythmic or non-rhythmic (NR) (left diagram) and rhythmic genes (994) were grouped into 15 models (right panel). Genes that were non-rhythmic in either one of the 15 models (11,991 genes) are represented in model 16. (B) Heat maps for genes assigned to models 1 to 4. Relative expression is indicated in green (low) and red (high). 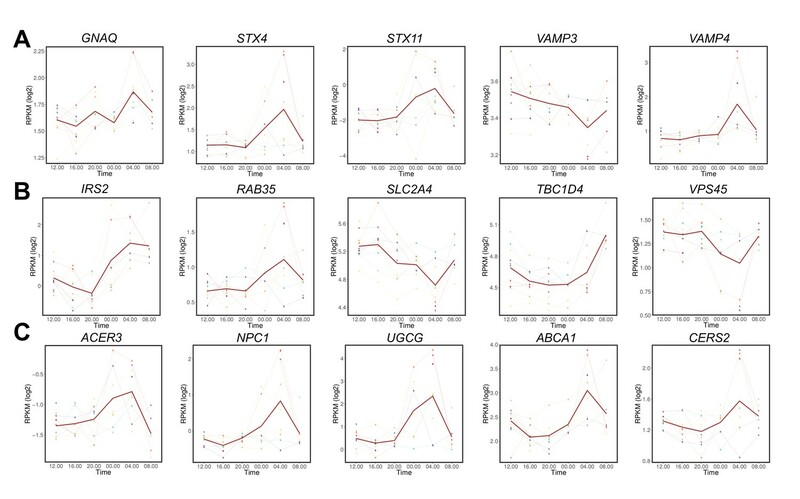 (C) Individual temporal expression profiles of core clock genes ARNTL, NR1D1, NR1D2, CRY1, CRY2, PER1, PER2 and PER3 in siControl or siCLOCK-transfected cells. (D) Upper panel: Representative examples for genes assigned to models 1–4. 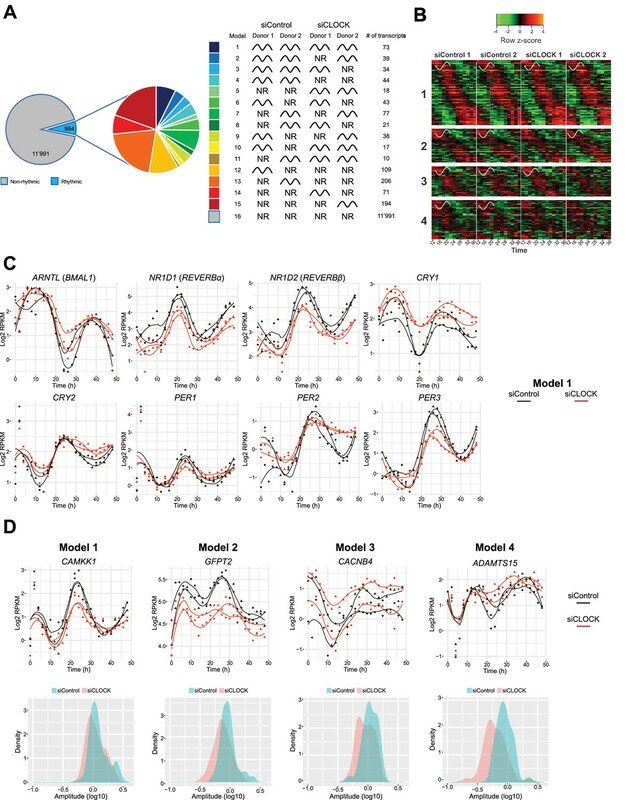 Lower panel: Circadian amplitude quantification of siControl and siCLOCK in models 1–4. List of genes found in each of the 16 models identified by rhythmic analysis of the RNA-seq data. A gene was classified into one category if the probability was >0.5. If the probability was <0.5, transcripts were grouped into model 16 (non-rhythmic). Related to Figure 4—figure supplement 1, Supplementary file 1-tables S4-S6. This dataset contains the log2 RPKM values for all 25 time points (0 to 48 hr) and the mean of all time points per donor and per condition (siControl/siCLOCK) as well as the model where each gene is grouped. GO term enrichment analysis, using the Panther classification system, for transcripts that were grouped into model 1. Related to Figure 4—figure supplements 1–3 and Supplementary file 1-table S4. Reactome enrichment analysis, using the Panther classification system, for genes that were grouped into model 1. Related to Figure 4—figure supplements 1–3 and Supplementary file 1-table S5. Comparison of rhythmic transcript profiles between the two donors. (A) More rhythmic transcripts are found in donor two compared to donor one in both siControl and siCLOCK condition either due to the genetic differences between both donors or due to a better response to the forskolin pulse used for synchronization. 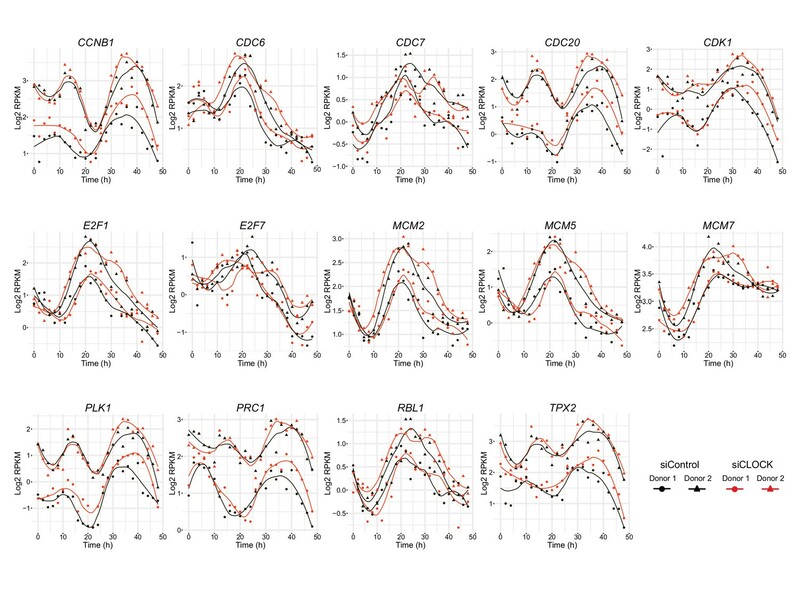 (B) Circadian amplitude quantification for the summary of models 1–4 in siControl and siCLOCK. (C) Examples of genes qualified as rhythmic in model 1–4. 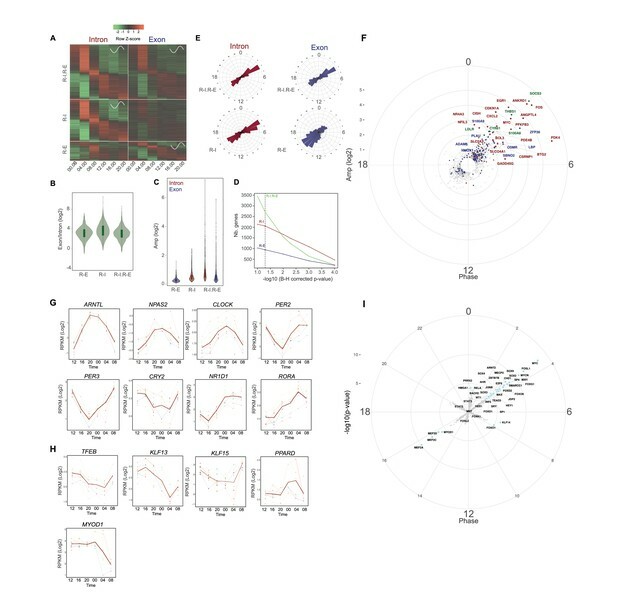 Temporal profiles of core clock transcript expression. (A) Expression profile of NPAS2, TEF and BHLHE41 assessed by RNA-seq. (B) ARNTL (BMAL1), NR1D1 (REVERBα) and PER3 measured by RT-qPCR. mRNA levels were analyzed every 4 hr over 48 hr for each donor to confirm the RNA-seq results. Data were normalized to the mean of 9S and HPRT. For donor one data represent monoplicates, whereas for donor two data were done in duplicates. Donor 1: circle; donor 2: triangle; siControl: black line; siCLOCK: red line. 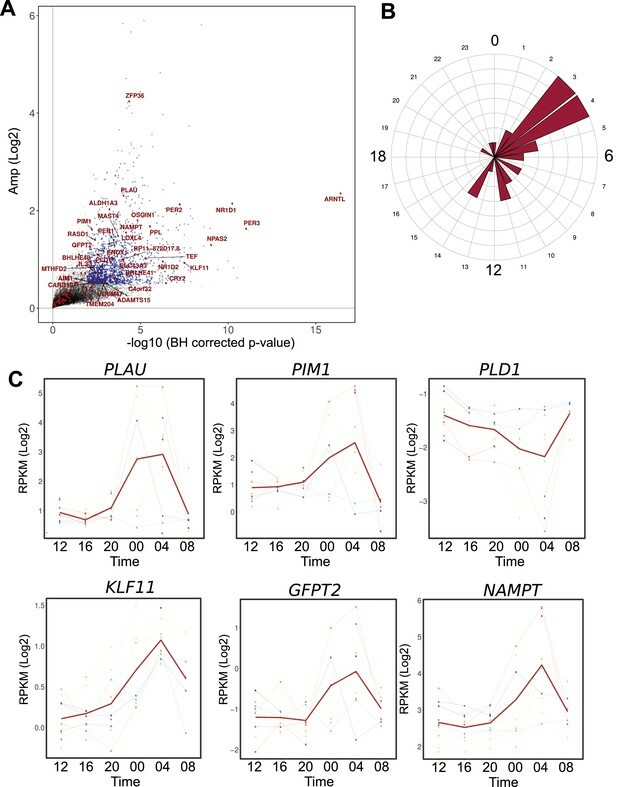 Genes involved in cell cycle regulation exhibit circadian expression profile in hSKM. 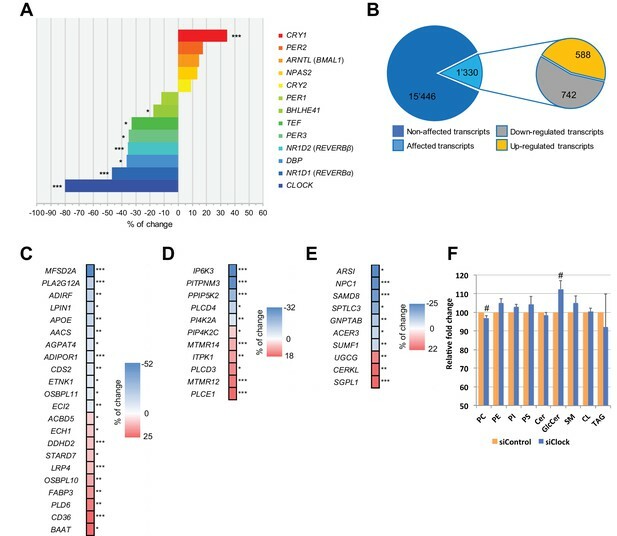 CCNB1, CDC6, CDC7, CDC20, CDK1, E2F1, E2F7, MCM2, MCM5, MCM7, PLK1, PRC1, RBL1/p107 and TPX2 expression profiles obtained by RNA-seq. All genes shown were classified in model 1 except for E2F1 and MCM5 (model 3). Comparison between the circadian transcriptome of human skeletal muscle and human primary myotubes. (A) Scatter plot, representing the amplitude of expression in relation to the corrected p-value for genes that were rhythmic in vivo (human muscle biopsies). Genes that were also rhythmic in vitro (hSKM, models 1–4) are colored in red. Blue dots represent genes with a p-value <0.01 and log2 amp >0.5. (B) Phase distribution plot of genes rhythmic in muscle biopsies and primary myotubes shows enrichment at the 04:00 time point. (C) Examples of genes, involved in glucose homeostasis and muscle regeneration, that are rhythmic in vivo and in vitro (RNA-seq data, N = 10). List of 190 genes, rhythmic in hSKMs. Transcripts representing non-protein coding sequences, pseudogenes or retired loci are colored in red, transcripts associated with cell cycle are colored in blue, transcripts related to cell differentiation, adhesion and proliferation are colored in green. 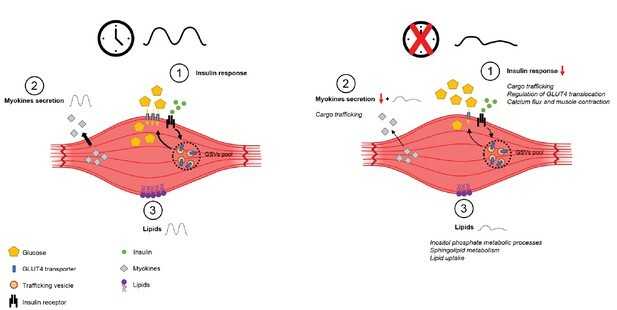 Schema summarizing impact of clock disruption on muscle metabolic function. Clock disruption leads to impaired insulin sensitivity and decrease in glucose uptake (1), causes a dysregulation of genes involved in vesicle trafficking (2) and impacts lipid metabolism and lipid metabolite oscillations (3) as reported in Loizides-Mangold et al. (2017). Comparison of our in vivo vastus lateralis rhythmic dataset with mouse skeletal muscle rhythmic data (Dyar et al., 2014; Zhang et al., 2014). 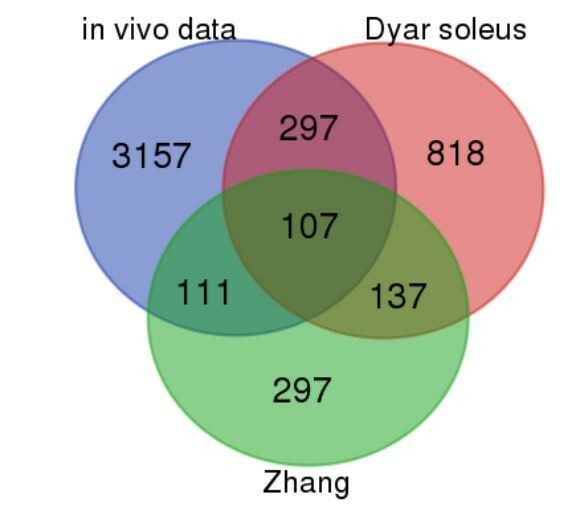 Blue = our in vivo RNAseq data; red = (Dyar et al., 2014) soleus; green = (Zhang et al., 2014). The numbers presented in the Venn diagram correspond to the total number of rhythmically expressed genes for each segment (exons only). For the human in vivo dataset (our work), this corresponds to R–E + R–I.R–E, with the cutoff described in the manuscript (Figure 1). For (Dyar et al., 2014) (microarray) and (Zhang et al., 2014) (microarray) rhythmic genes were identified using a Benjamini–Hochberg q–value <0.2 in the JTK_Cycle algorithm. Examples of the gene expression profiles from our database qualified as circadian by JTK_CYCLE. Publicly available at the NCBI Gene Expression Omnibus (accession no: GSE108539). Publicly available at the NCBI Gene Expression Omnibus (accession no: GSE109825). Detailed list of exact p-values and raw data related to Figures 2 and 3.